If you have kids, colds are a fact of life. It can be hard to offer relief for kids with a stuffy nose from a cold or allergies. One thing that’s helpful is to humidify the air. “The Crane Ultrasonic Humidifier definitely did as advertised. It was very quiet, and sometimes I couldn’t see the mist coming out of the top-but the reservoir was emptying-so something was working!” says Michelle Davis-Dash, MD, a mom of one son and a pediatrician in Baltimore, Maryland. The Crane Ultrasonic Humidifier uses cool mist to increase air moisture for easier breathing and a good night’s sleep. It can relieve cough, cold, and flu symptoms, including nasal congestion, dry cough, sinus irritation, nose bleeds, dry skin. Its 1-gallon water tank runs whisper quiet for up to 24 hours, misting up to 2.1 gallons of moisture per day. It effectively humidifies rooms up to 250 square feet. If you’re concerned about leaving it on accidentally, it has an auto shutoff safety sensor. It’s cost effective, using less energy than a standard household light bulb. And it’s maintenance-free, not requiring a filter. It comes in the most adorable shapes, including duck, frog, tiger, cow, penguin, monkey, kitty, and dog. They cost around $40. For more information and to purchase one, visit: www.pishposhbaby.com. 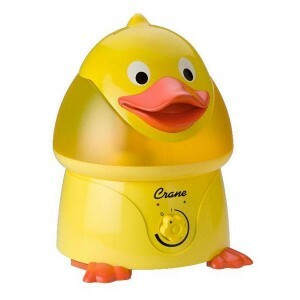 Note: We received sample(s) of the PishPoshBaby Crane Adorable Animals Cool Mist Humidifier in exchange for our honest opinions. Regardless, we only recommend products or services we use personally and believe will be good for our readers.